When you are working on a construction site or even when you are working at home on a remodel or project, it is important to have the appropriate tools to get your job completed. There are many different tools that you may need in order to complete the job. But sometimes there are certain conditions that hinder those tools from working properly. This is certainly true when you are using a laser level. Sometimes work spaces can be cramped and dark, or the workspace may be too bright or too much space between one object and another. Either way, these conditions should not stop you from easily using a laser level. You just need to add the best laser level detector to your toolbox to find the laser beam in these conditions. What is a Laser Level Detector? The name speaks for itself really, much as a stud finder helps you find studs in walls, a laser level detector is a tool that helps locate the fine laser beam from a laser level. They can enable a contractor be able to see the beam when conditions might make this difficult, and continue to measure out the projects on the jobsite. 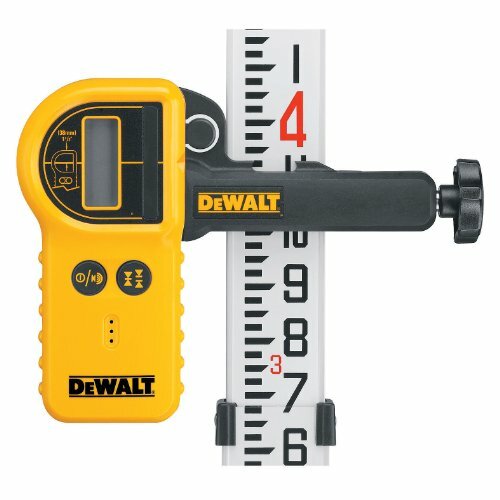 This helps the contractor easily find the appropriate measurement and helps the job continue to flow quickly and easily. There are certain features that are really important to look for when you are choosing a laser level detector for your personal use. When you are choosing the perfect laser level detector for you, you should consider a couple of important features. First you should check the compatibility of the laser level to the laser level detector. Laser levels and laser level detectors work on wavelengths. You should be absolutely sure that the two products are functioning on the same wavelength, or you may have a connection problem that may give you an inaccurate measurement. The detecting range is also really important. Depending on your job site and the project that you are completing at that time will be a determining factor of how long you need your laser level to be able to reach. It is important that the detector to be able to reach the same level as well. You might also want to consider if you would like a laser level detector that has an audio indicator or a visual indicator. These indicators let you know when the right grade and the right measurement has been reached. There are plenty of other specific settings that help you get the accurate measurement and other results that you would like to have. These settings are directly related to the price of the laser level detector. The more customizable features that are included, the higher the price tag will be. There are several different brands of laser level detectors available on the market today. These products are typically affordable and usually easy to buy. Here are a few examples of really great laser level detectors and the features that they each have. 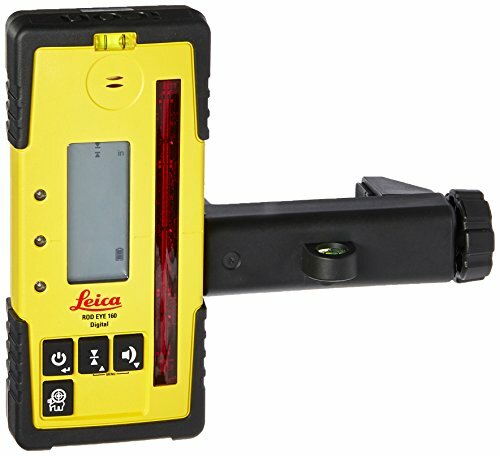 The Leica Laser Receiver is a laser level detector that allows red laser beams to be detected in harsh light conditions. This product allows the level to be detected in distances up to 200 feet. The product includes a large display window that is about 1.65 inches and offers audio and visual indicators that can help locate the laser area. The design of this laser level detector is really ergonomic and is very easy to hold in your hand. There is a display on the front and the back of the receiver, and the receiver has included magnets, so that the level can attach to metal surfaces, like steel beams and studs, in order to get a more perfect and precise measurements. This laser level detector will not find laser dots, but rather it will find pulsed laser beams. This receiver also comes with a receiver holder for making adjustments to the measurements quickly and easily. The RVL100 is compatible with all LINO line laser products, however, they must be in pulse mode. 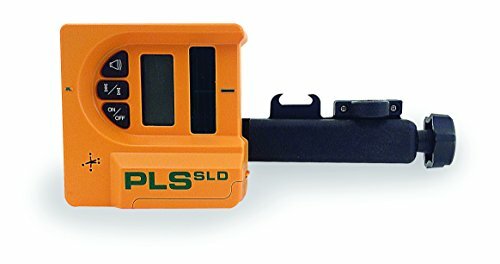 This laser level detector comes with a two-year warranty when you buy it and offers an additional year after registering your product online. The laser level detector requires an included 9 volt battery to work. 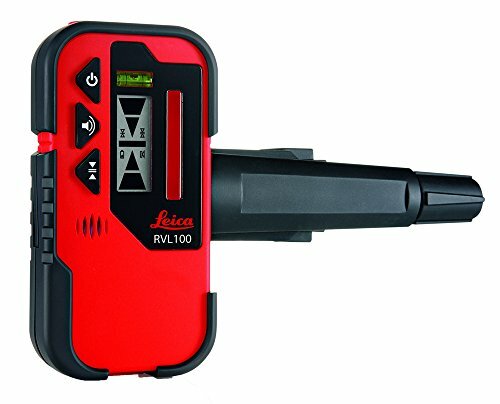 Leica offers another great laser level detector with the Digital Rugby Rod. This laser level detector offers a large 5 inch laser detection window for easily viewing the accurate measurements. This window also allows for an easier pick-up of the laser itself. The detection range is up to 4430 feet and has five levels of accuracy, meaning your measurement will be very precise every time. The display is an LCD display and there is a display on the front and the back of the product. The product includes a protective mold on the ends and on the corners of the product itself. The laser level detector offers a digital read out that can display different units of measurement and other mathematical features like inches, fractions, 100s of a foot and metric systems. The product also has and includes a grade rod bracket that offers integrated level vials. The laser level detector can pick up laser beams from rotary lasers. 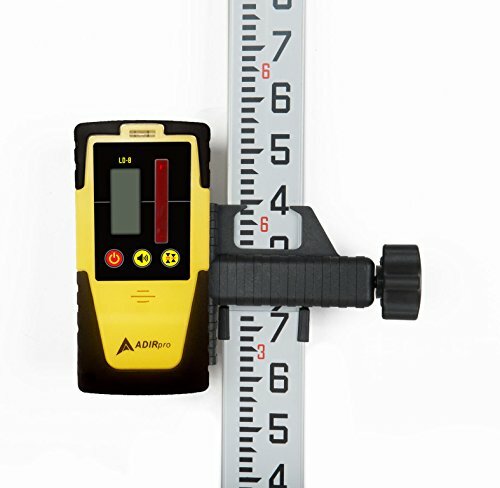 The AdirPro LD-8 features a dual-sided LCD display for an easy way to see the measurement read out and it is available to read on both sides of the product. When you see the measurement readouts they are clear and very easy to understand. The display also shows the elevation and grade sensitivity. This laser level detector offers an audio indicator and has a working range of about 100 feet. The user-friendly interface is definitely appreciated as well as the simple design helps you get the laser working fast for the accurate measurement. This level detector has a volume and backlight buttons that can be adjusted with a single touch. There is a magnetic strip that helps attach the receiver on metal surfaces for a great starting point for laser detection. The construction of the product is really durable. It’s made from a hard plastic housing and rubbing casings. These will also protect the detection features from different weather elements. The compatible mounting rod helps you connect the receiver to a grade rod or a wooden pole. The AdirPro comes with two AA batteries that can last for 40 hours of work. The automatic shut off feature helps save battery life by powering down after 10 minutes of no use. 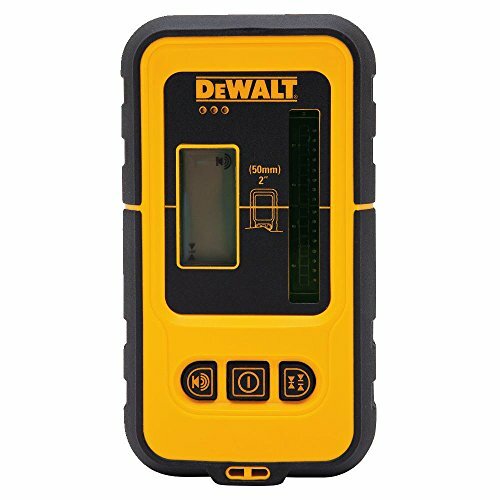 DEWALT’s laser level detector is another example of their superior product line. This laser detector is accurate up to 30 meters and has a working range of 165 feet. This laser level detector packs a one-two punch by being able to detect a laser beam indoors and outside, for accurate measurements literally anywhere and everywhere. The dual-sided design offers an LCD screen display on the front and the back. This detector offers an audio indicator and can be controlled with an adjustable volume button. This laser level detector offers an automatic shut off censor, which will turn itself off after five minutes of no use. This saves the battery and helps extend working life. The product features top mounted magnets, for a variety of areas for the detector to fit, including ceilings and steel studs. The DW0892G operates on an included 9V battery and is heavy duty for measurements in any area that has harsh weather elements. DEWALT’s DW0772 model of laser detectors offers a consistent and accurate measurement regardless of the size of the beam. This detector is compatible with all rotary lasers which helps extend the operating range of most of the compatible lasers by over 1000 feet. This detector can find the laser in any type of lighting – indoor, outside, invisible beams, etc. 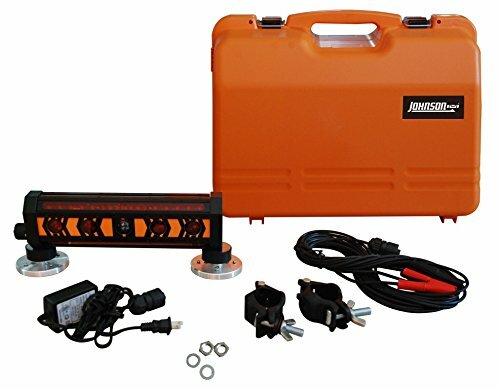 This design is 100 percent waterproof, a plus if it is raining outside of if you are working around an area where the laser level detector may come into contact with water. There are also durable windows on this model that prevent it from breaking if it is accidently hit by a nail or a screw. The heavy duty, well-made clamp included, is perfect if the need to clamp it to an object on the jobsite arises. There are also front and back LCD displays that show you information and the accurate measurements that you need in order to complete your project. There are three different volume levels on this model as well for a more customizable experience. 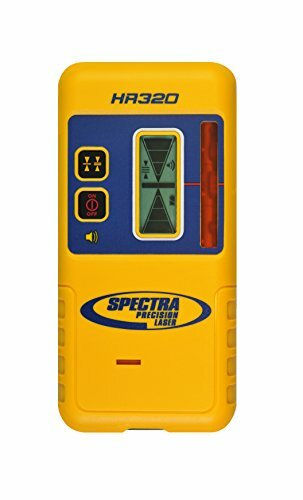 This laser level detector from Spectra is a larger detector that is really easily read. The large LCD screens on the front and the back that makes it ideal for exterior jobs. The product also includes a loud 100 dB speaker that is perfect for noisy areas and jobsites. The detector has a C59 rod clamp that offers a snap feature to easily attach it to the rod, but makes it really easy to get off the rod and hold it in your hands. The Trimble HR320 is very rugged and waterproof, so much in fact that it can withstand a drop or fall from five feet. The design keeps out the harsh elements of the jobsite and helps to ensure that the laser detector has a long life. The Trimble HR320 is also backed by a three year limited warranty, just in case something happens to the detector or it gets stolen. This detector is really easy to read and is compatible with any universal rotary red laser beam. The Johnson Level 40-6705 has an accurate detection of red laser beams up to 650mm and the signals it detects are from rotary lasers. This detector features an LED Display and has three lights that alert on the grade whether it is too high or too low. The detector features an audio indicator and will beep only when the laser is either too high or low. The LED lights will then tell the contractor which direction to find the laser. There will be a solid tone when the laser is found and is right on the money. There is also a different sound for a low battery. The battery check is performed at start up and there will be another alert when the battery is low or getting exhausted. The accuracy levels are adjustable and installation is really easy with the assistance of magnets. 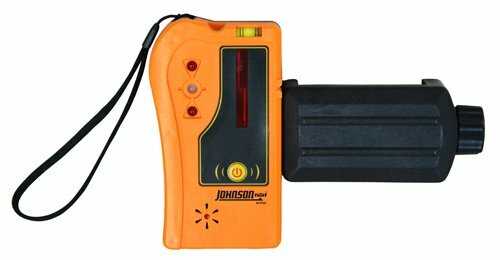 The Johnson 40-6791 laser level detector offers a machine mountable clamp with a magnet and NiHM rechargeable battery pack. The detector has a working range of about 650 feet and has an accuracy level on fine three millimeters to 25 millimeters, but on coarse five millimeters to 25 millimeters. This detector has a 10 inch large viewing window and a 360 degree receiving angle. The battery life on this detector can last up to 40 working hours per charge. The detector has a three year warranty and comes complete with a hard shell carrying case. This detector features earth magnets that are extremely strong that are capable of holding the detector exactly where you want it to stay. This is a really great laser level detector if you are around harsh weather elements every day. The Pacific Laser System PLS 60618 is another type of laser level detector that has a green laser instead of a red one. This detector is recommended for use in an outdoor setting when it is bright and sunny. The detector comes equipped with a grade rod clamp that is used to hold the detector up in case it needs to be mounted up somewhere to get the most accurate measurement. This detector is compatible with the PLS 180 G. The device itself is really small and could easily fit in the palm of your hand or in a pocket. It is also very lightweight, so if you had to hold the detector in your hand the entire day, it would be possible. The laser detector comes with an audio indicator and the volume can be adjusted by pushing the button located on the front of the device. There is also an on/off button that is great for saving battery life. The device comes with an alkaline battery and it can last up to 40 hours of work. The 60618 offers a three year limited warranty. These nine laser level detectors are some of the best and most affordable detectors on the market today. Most of them are small and compact enough to carry around in your pocket or hand. These laser level detectors are extremely helpful in site situations. Especially where deadlines loom, visibility is questionable and you need to have an accurate measurement fast. Check out these laser level detectors for yourself and see what you think. They will certainly be a new staple in your toolbox to assist with your laser level measurements.